An explosion occurred Thursday at the Letterkenny Army Depot in Franklin County, Pennsylvania. Four people were injured, at least three severely. 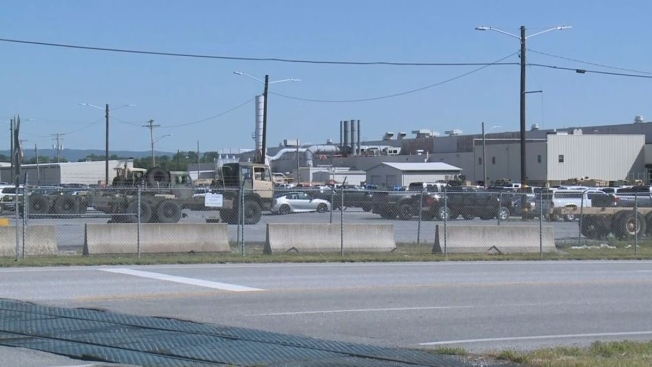 A civilian worker killed in a fire and explosion at an Army facility in Pennsylvania died from burns, officials announced Friday. The Lehigh County coroner's office identified the victim as Eric Byers, 29, a resident of the Philadelphia suburbs. Byers was pronounced dead just after 7 p.m. Thursday at Lehigh Valley Hospital-Cedar Crest. The coroner's office said Byers was handling chemicals when a flash fire occurred. Four other civilian employees were injured in the fire at Letterkenny Army Depot. The depot's commander said Friday that two victims remain hospitalized in critical but stable condition. Two others were treated at local hospitals and released. "The entire Letterkenny family is mourning this loss," the depot commander, Col. Stephen Ledbetter, said in a statement. "We continue to keep the families and all of our teammates in our thoughts and prayers." The blast and fire occurred Thursday morning in a painting area for vehicles at the facility in Chambersburg, about 160 miles (260 kilometers) west of Philadelphia. The 18,000-acre depot handles air defense tactical missile ground support equipment, mobile electric power generation equipment, Patriot missile recertification and route guidance vehicles.